Amazing light in texture banana cake made with a cake mix and chocolate! A delicious moist cake no one can tell it's made with a cake mix! Plain cake with a dusting of powdered sugar, it's still fabulous! Heat oven to 350 degrees and in the meantime prepare the pans you will use. I used two mini bundt pans and a large bundt pan. You can also use a 13x9 sheet cake. The cake will rise nicely and be full. Generously grease your pan and set aside. In a large bowl with either a hand mixer or a Kitchen aid, beat all ingredients above for at least two minutes. Using a spatula, carefully empty into your prepared pan. Bake at 350 degrees. Baking time varies. If using the small bundts this takes around 25 minutes testing with a toothpick in the center. The larger cakes take around 45 to 50 minutes. Garnishing these cakes are so much fun and versatile. Some suggestions: decorate with fresh fruits and whipped cream like a banana split. 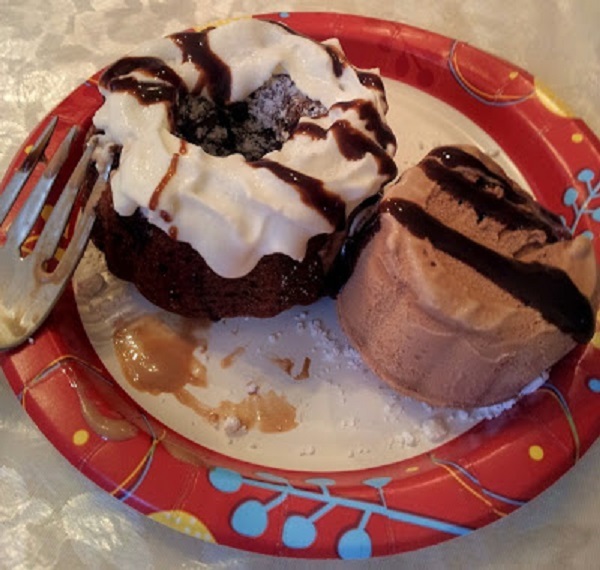 Try some whipped cream, ice cream of choice and hot fudge sauce. Or keep it simple as it is super moist cake with just some powdered sugar. A light glaze will be delicious too. Have fun and enjoy! Easy to make and delicious as well! That sounds so delicious! Great use of the cake mix, C! Awesome little cakes, Claudia. I found some of my 'doctored up' cake mix recipes since I made the strawberry cake last week...even found one of my chocolate cake recipes, that has cherry pie filling mixed into the cake mix, which I haven't made since the mid eighties...like over 25yrs ago! I love these doctored up cake mix recipes...they're always moist and delicious! And what a sweet gift from your SIL...beautiful cake plate. Hi, your cake look really awesome, love the combination of bananas and chocolate. The dressing up of the cake look excellent. I love it. Dear Claudia, These are the best gifts. They are given with good memories and from the heart. What a nice cake stand. Makes me wish I had one but where would I keep it when I wasn't using it? What a sweet and great gift. Your cake looks beautiful on it. Thanks for being a part of the YBR:) Have a great holiday. Love the minis Claudia! I've used this recipe less one egg, it's awesome.